Life with Liv: Win a £50 Toxicfox voucher for Mothers Day. 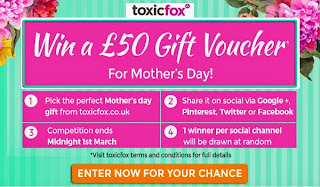 Win a £50 Toxicfox voucher for Mothers Day. With Mothers Day fast approaching (Sunday the 15th of March) I'm sure you have started to look for guft ideas - especially if your Mums are as difficult to buy for as mine is! Well how would you like to win £50 to spend on the Mother’s Day collection at www.toxicfox.co.uk?! Of course you would! Firstly pop over to Toxic Fox and browse the Mothers Day collection. Once you have found your favourite gift you are ready to enter. Beneath your favourite item are social media icons allowing you to Tweet, Share, G+ Pi or use the hashtag #toxicfox to enter. There are four chances to win, one winner each on Facebook, Twitter, G+ and Pinterest. Start date - 18th February 2015. End date - 1st March 2015. Winners will be announced on the 3rd of March. Livs new dress from House of Fraser - review.